I am a HUGE fan of Panera Bread. Those of you that aren't fortunate enough to have one in your area are definitely missing out. May I highly suggest you schedule a trip to the Midwest soon so you can divulge in all the Panera goodness we have to offer?? One of the Panera's "blue ribbon" items is their Broccoli Cheddar Soup. You can either have it served in a bread bowl or regular bowl and it is a huge staple around here in our family; especially in the winter months. Knowing how much I like to recreate recipes of other food establishments *cough*Chipotle's Guacamole*cough*...I had to definitely try my hand at Panera's B&C soup. This recipe definitely does not disappoint and tastes quite a bit like the original if I do say so myself. I added some celery to my recipe just for some added flavor and texture, but I'll not include that in the recipe below as it's clearly an option. And I'm not sure Panera has celery in theirs. So if you're looking to recreate your favorite soup at home, look no further! By now the soup should be thickened. I apologize that my picture below is HORRID and it's in gladware. I didn't have the time to stage it nicely, but it's not about the pic, right? Just focus on the awesome goodness that is this soup! HA! Oh my goodness...if you don't try this chili, I will truly think you're NUTS. 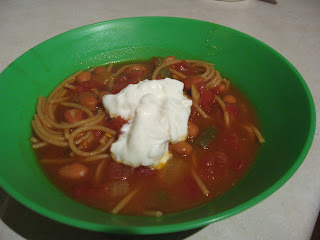 In all sincerity, this is one of the best chili recipes I've tasted in a LONG time. And I'm not pullin your leg. It's spicy, but not so spicy that you should be heading to bed with heart burn. But it's just the right amount of spicy to add some "kick" to your day. And for those of you in the bone-chilling midwest like me right now, this is exactly what you need to WARM UP! I'm not so sure I'd call it a true "chili" as I felt it was a little less "hearty" in that respect. It's kind of more of a soup, in my opinion. 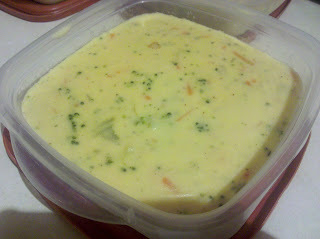 I got this recipe from a weekly email I receive from Betty Crocker called "Dinner Made Easy." I had this whole chili whipped up in under 30 minutes from chopping board for the veggies to a nice steaming bowl of chili topped with sour cream. This is so simple to make and easily adaptable to lessen or enhance the spice as you see fit. I also used whole wheat spaghetti as that's all we eat for pasta around here, but I'm sure regular spaghetti would be just as good. I loved that it had a touch of cinnamon! The flavor added SO much. At first I was a bit freaked out when I saw it on the list of ingredients, but without it, I think you'd definitely notice something missing in the flavor. Please let me know if you try this! I'd be curious your thoughts on it! 1. Heat oil in 4-quart Dutch oven over medium-high heat. Cook onion and bell pepper in oil 3 to 5 minutes, stirring occasionally until crisp-tender. 2. Stir in remaining ingredients except spaghetti and beans. Heat to boiling; reduce heat to medium-low. Simmer uncovered 5 minutes, stirring occasionally. 3. 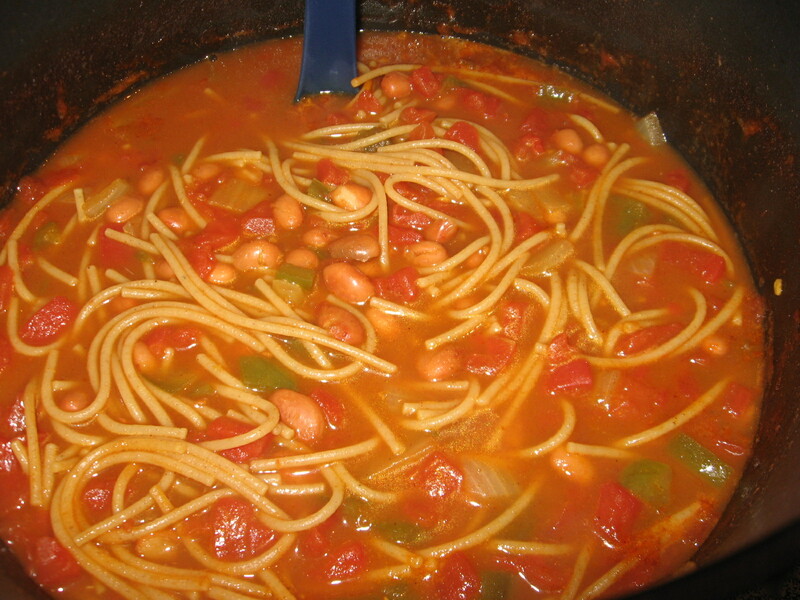 Stir in spaghetti and beans. Heat to boiling; reduce heat to medium. Cook uncovered 8 to 10 minutes, stirring occasionally until spaghetti is tender. Garnish each serving with sour cream and jalapeño chilies. **side note: This chili is based off the rather famous "Cincinnati Chili recipe" that is typically served over spaghetti. Wow! Where has the time gone?! I missed the entire month of November! Honestly, I've definitely been in the kitchen, but I've been making past recipes from the blog that we haven't had in a while, hence the minor blog hiatus. I have tried a couple recipes lately and want to share one with you all this evening. I got the original idea from this Betty Crocker Chicken Enchilada recipe, but adapted it to fit us a bit more, and fit with what I had in my kitchen at the moment! It was so easy to whip up this delicious meal and it's very easy to adapt to fit your taste buds too! 1. Brown ground beef in pan and add taco seasoning mix according to package directions. 2.Spray 3- to 4-quart slow cooker with cooking spray. In cooker, spread 1 can of the green chiles. 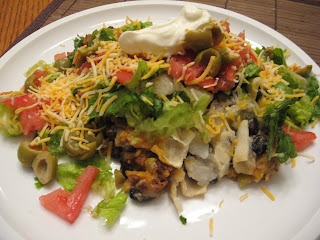 In medium bowl, mix remaining can of green chiles, enchilada sauce and mayonnaise. 3. Arrange 1/3 of the tortilla strips over chiles in cooker. Top with 1/2 cup of beef, 1/2 cup of the beans, 1/2 cup of the cheese and 1 cup of the enchilada sauce mixture, spreading to edges of cooker to completely cover tortilla strips. Repeat layers twice, reserving last 1/2 cup of cheese. 4.Cover; cook on Low heat setting 6 to 7 hours. I promise there's casserole under that big mound of lettuce and fixins!